I know that a lot of people hate the chore of washing their makeup brushes and would actually prefer to just buy lots of brushes to avoid having to wash them very often, but it's important that they are washed regularly because of bacteria build up. I don't hate washing my brushes but don't love it either. It is a time-consuming task so anything that will make it faster and easier is always going to grab my attention so when The Brush Bar got in touch with me to try their products, I had a read and thought they would be really helpful and that I should give them a go! I was sent the Makeup Brush Care Pack, which consists of 1 brush bar and 1 brush board. The brush board has 6 different sections to "exfoliate" your brushes. Basically, each section has different shaped ridges/textures and you apply some brush cleanser (I use Moo Goo Mini Moo Bubbly Wash) and water and then swirl the brushes over the board. Each brush is clean in less than a minute - no need to scrub to try and get every last bit of foundation out! This is the fastest and easiest method I've ever used to wash my brushes. The company say that you don't need to get your hands yet by using this board because there is a hole at one end, which you hold but I personally lay it flat in my sink and use it that way. The board can be rinsed with warm water when you're finished and set aside to dry. It comes in a velvet-textured pouch for storage. This is a genius product and I would urge anybody who finds washing their brushes a time-consuming chore to buy one of these! The second product is the brush bar, which can be used to store your brushes or also to allow them to dry without getting misshapen from lying down flat. This compact is opened to reveal 10 "hooks" that are varying sizes to hold brushes. It is placed on the edge of your sink/table/dresser, thereby allowing your brushes to hang without any side being flat. I was worried that my brushes would fall out of it but once you select the correct hook (there are small, medium and large), the brushes don't budge. When you are finished using it, the hooks can be slotted back inside the holder and stored away until next time it's needed. I personally only use it for drying my brushes but I can see why people would like to use it to store brushes. The brush bar is priced at $38 and the brush board is priced at $28 or you can buy both for $55. International shipping is $19.99 and there is free shipping on all orders within the U.S. The package took around a week to reach me and I didn't incur any customs fees. If you are interested in purchasing these products, you can save 15% on your first order by using the code BEAUTYLY15. I'd love to hear your thoughts on these products? 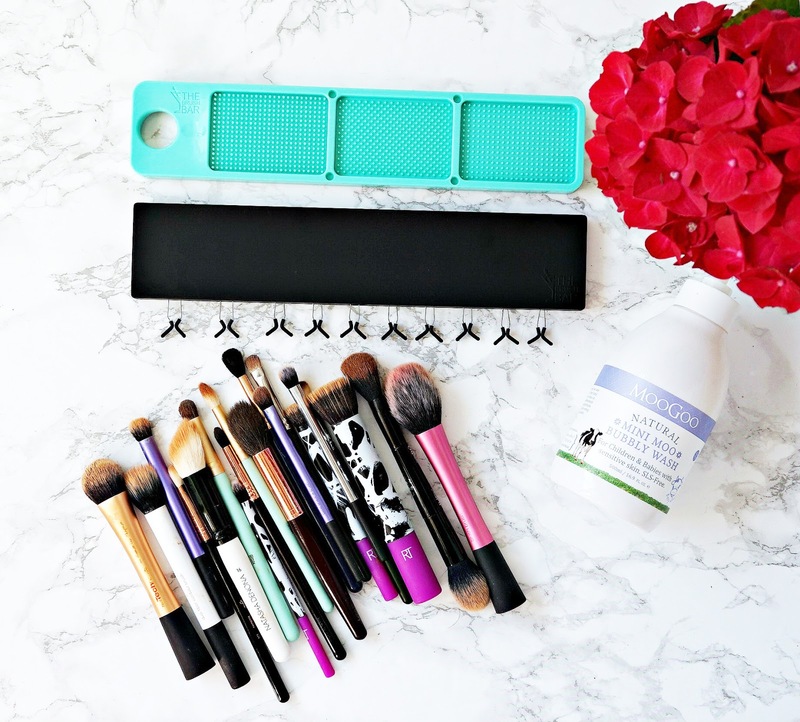 Do you consider washing your brushes a chore? All products are bought by me, unless otherwise stated. These two Brush Bar products were sent to me. Opinion is always my own.